In the 19th century, Araby’s town was hit by a terrible disease. People are dying by the dozen and the town was forced to establish a system of corpse collectors to gather the victims bodies. The disease is thought to travel in the air and Araby’s father invented masks to keep the population as safe as possible, unfortunately Prince Prospero took control of the invention, selling masks at a ridiculously high price, leaving the poor unprotected. Araby’s twin brother Finn was a victim of the plague, and life has never been the same since. She tries to forget herself night after night using drugs and alcohol, hanging with her friend April in a club called Debauchery Club. Little did she know that two boys destined to change her life forever would also be regulars of the club, will their reunion be for better or for worst? The Masque of Red Death is an highly original story. Inspired by Edgar Allen Poe’s short story, Bethany created a magical, yet terrible, world for her characters to evolve in. It’s not easy to set this story in place and time because it’s all fictional. The little town featured is set near the water, and has a port. We also understand from different story elements, such has steam carriages and muskets, that the story is set in the 1800s. Also, the lack of understanding of the plague increases this historical feeling. I guess you could describe this novel as historical dystopian (if such thing exist?) with steampunk elements. However you want to describe the genre, the important part to remember is that this book is awesome. Araby’s little town has been isolated by this contagion and they don’t know if there’s any one left alive on Earth. All the citizens live in fear of the all mighty, and particularly mean, Prince Prospero and a rebellion is brewing. Bethany did a fantastic job of portraying the citizens despair, constant fear of the disease, and the escalating violence was very believable. The atmosphere is thoroughly glooming and menacing, murderers are walking the streets and rebels are setting fire to buildings. Nobody is safe and after meeting Elliot, the Prince’s rebel nephew, Araby wants to try and make a difference. Araby’s character was really intriguing. At first, she acts like she doesn’t have a care in the world. Going out to parties, taking unidentified drugs for oblivion’s sake, living on the edge, but what you discover with time is that she’s trying to drown her pain. She is still grieving her twin brother and she can’t manage the hurt. She even took a vow to never experience something her brother would never get to do, pushing her own life out of reach. Her pain was sometimes hard to bear, but her slow evolution was a work of wonder. Will, a pretty and caring young man, will help her see the better side of life, pushing her to live for her dead brother instead of slowly killing herself. Their relationship was really sweet, though far from perfect, and it surprised me in many ways. Bethany Griffin tailored a very mysterious storyline and it worked perfectly. The entire time you follow the main characters and wonder where this will all lead. Sickness, conspiracies, kidnapping and murders, nobody is who they seem in this twisted and wicked world and the truth hit you like a truck when all is revealed. Everything flows seamlessly, and the non-stop suspense will keep you glued to the pages. Masque of Red Death is only the peak of the iceberg and the main plot doesn’t come to a conclusion in this book. Griffin set the table for what I think will be an extremely interesting second book now that all the players have been given a role, all awaiting for the showdown. 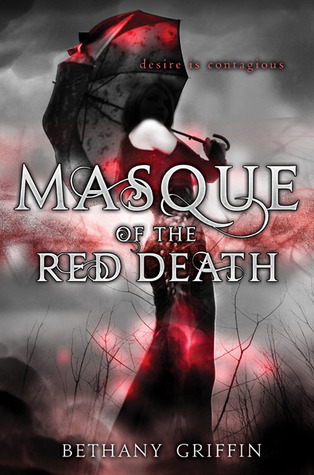 Dark, gritty and amazingly entertaining, Masque of Red Death isn’t for the faint of heart. It is a young adult title, but I wouldn’t recommend for 15 years old or lower as the sheer number of death and graphic description of the sickness is sometimes down right gruesome. If my love of this book isn’t obvious by now, let me tell you that you don’t want to miss this unique story, its worth every single penny you’ll spend to read it. Oh and on a side note, how amazing is this cover? I mean, really! And totally in line with the story. I've heard SUCH amazing things about this creepy book. Can't wait to pick up a copy for myself :) Plus, genre-bending is awesome. I've had my eye on this book for awhile now. I love the cover and it sounds like from all the great reviews I've read lately an awesome read. I really want it it's been in my to-read-wish-list pile. Great review as usual! I love the cover of this book soooo much. It is beautiful and slightly creepy which seems to fit the book theme. I have always loved Poe's poems, short stories, and his novel The Narrative of Arthur Gordon Pym of Nantuckett. Your review of this book is outstanding. I loved how you described the story without giving away any key plot points. I really can't wait to read it, and would love to win a copy! Love the bookmark too; so cool. As for the question, I really don't know what story I would re-imagine. I am not very creative myself. I love to read, and read all of the time. But I will never be an author. Thankfully there are plenty of very talented authors out there, and I love finding their works. Thanks again for the great giveaway! So glad you loved the review =) TY! I'm really excited about this! I have an ARC and I've pretty much only seen good reviews of this especially praising the world created. That's a huge element for me in non-contemporaries and I'm glad to hear this is great!